Albany, NY - July 7, 2015 - Governor Cuomo signed his “Enough is Enough” legislation to combat sexual assault on college and university campuses statewide. The new law requires all colleges to adopt a set of comprehensive procedures and guidelines, including a uniform definition of affirmative consent, a statewide amnesty policy, and expanded access to law enforcement to ensure the safety of all students attending colleges in New York State. "I was proud to stand with Governor Cuomo as he signed into law a strong tool for all the educators, administrators and women fighting to end campus sexual assault...New York is leading the way forward for our nation," said Nancy Pelosi, House Democrat Leader. 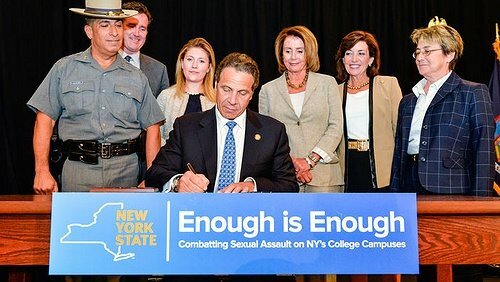 Subject: LongIsland.com - Your Name sent you Article details of "Governor Cuomo Signs "Enough Is Enough" Legislation to Combat Sexual Assault on College and University Campuses"